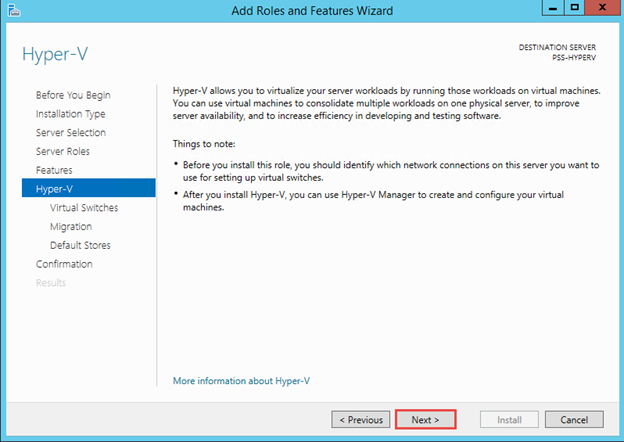 We are going to setup a new Hyper-V server with two Network Interfaces on it. 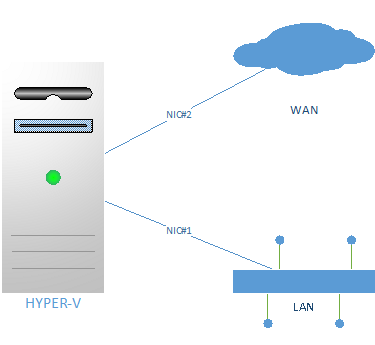 The first one is used for the LAN and the second one is dedicated for the WAN network. 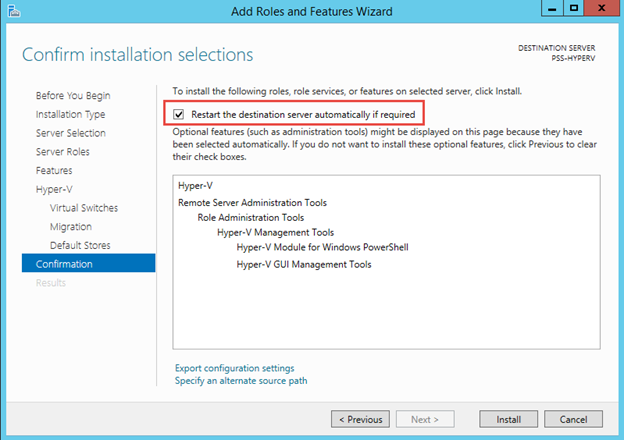 On the target Windows 2012 R2 Server, click the Server Manager icon in the Taskbar to launch it. 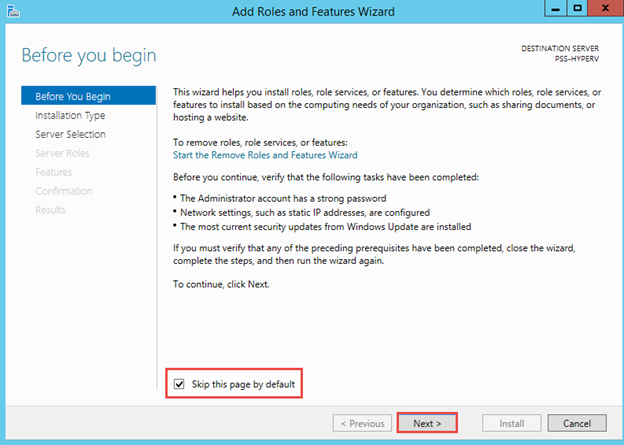 Skip the Welcome Page. Click Next. 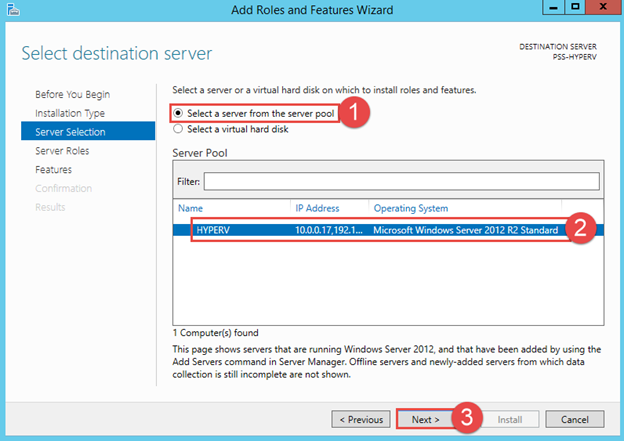 Choose the server to install and click Next. Don’t choose any features, click Next. 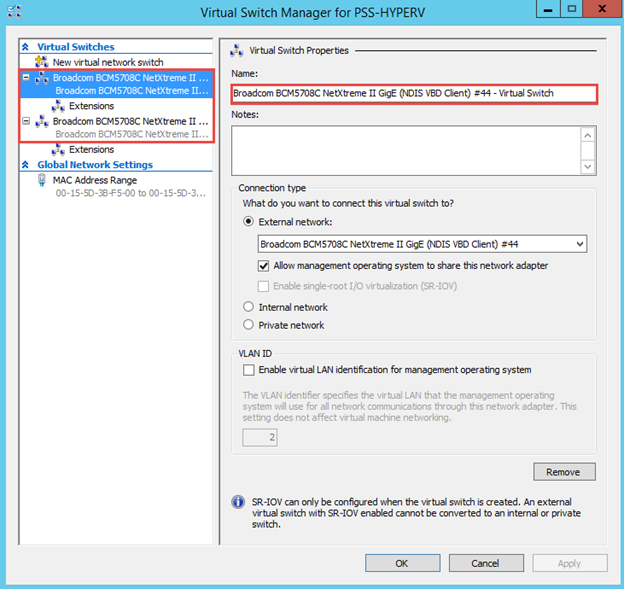 Choose both NICs (Internal and External) for Virtual Switches. Click Next. 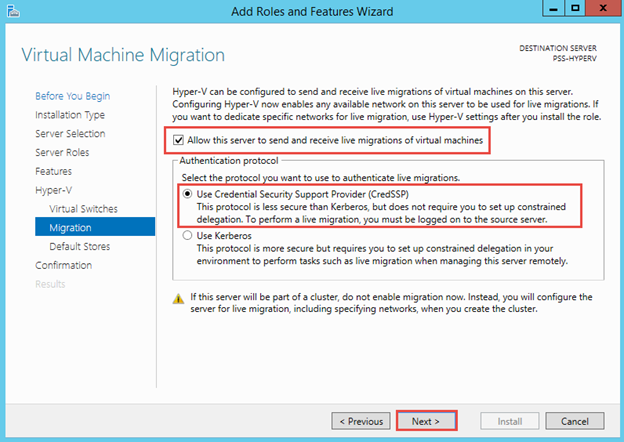 Choose the following Live Migration options. Click Next. 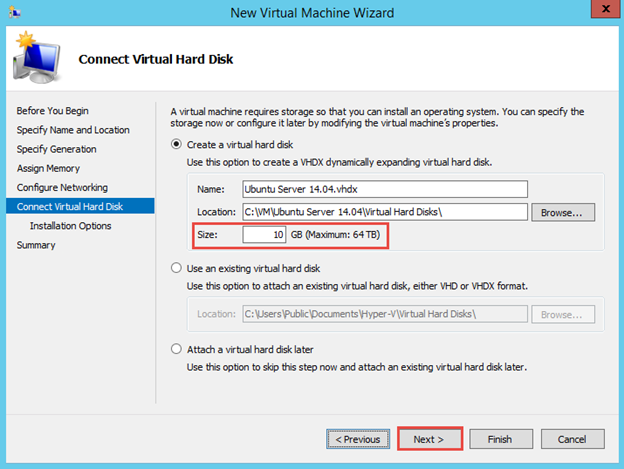 Leave the default locations for VM Hard Disks and VM Configuration files. Click Next. 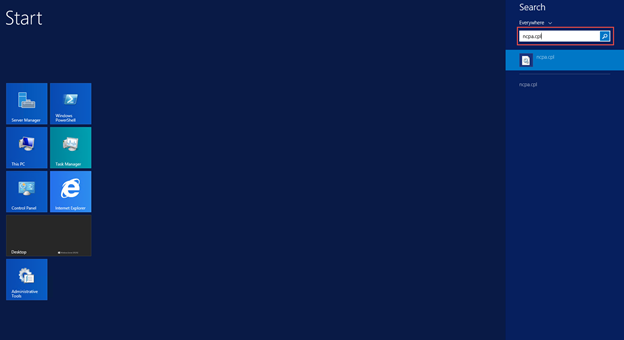 Choose to allow the Restart of the computer. 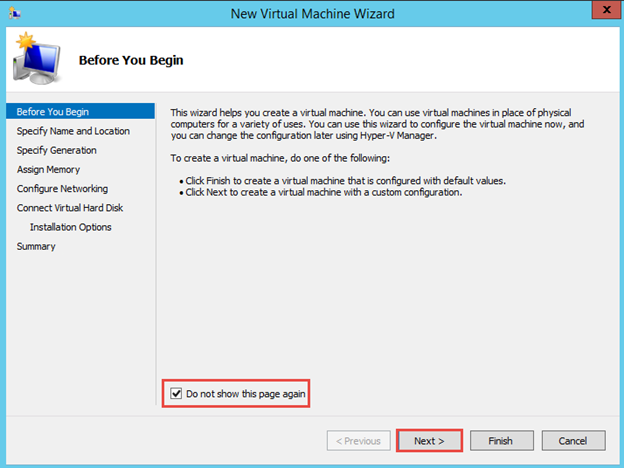 If prompted, click Yes to allow the restart to happen. 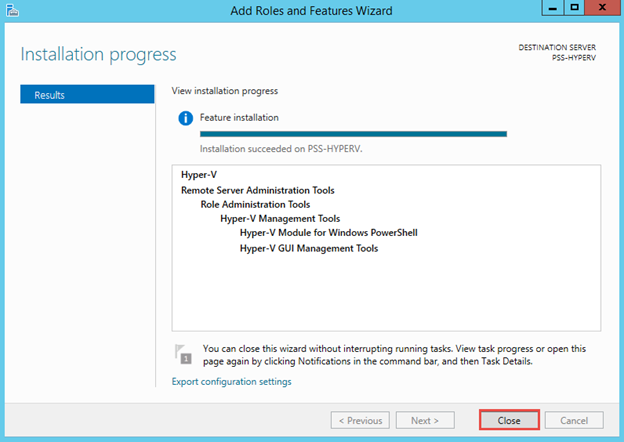 Wait for the installation to finish. 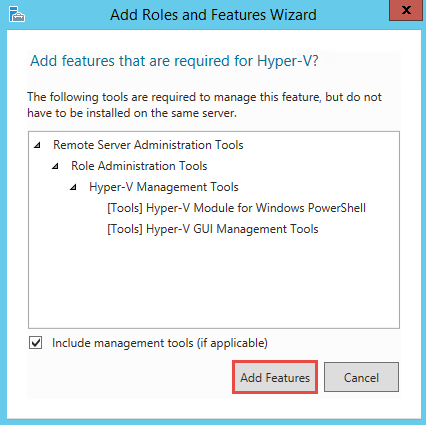 The server will restart automatically when it is done installing the Hyper-V role. 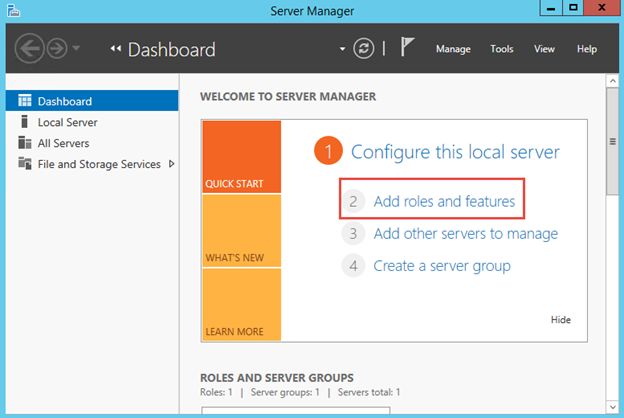 When the server comes back up, the associated features will be installed automatically. Click Close when done. 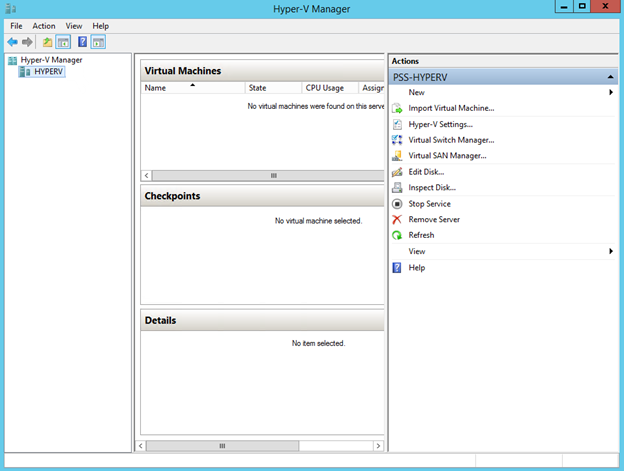 In the Server Manager screen, you can see a new tab called Hyper-V. Click it to list all Hyper-V servers. 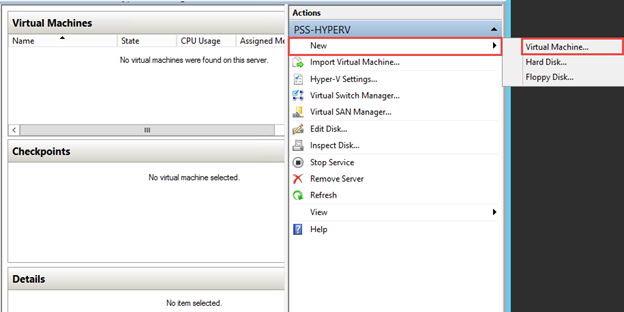 In this case, I only have one Hyper-V server. 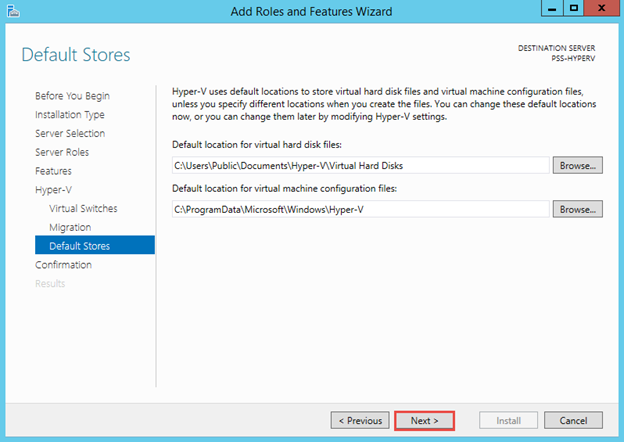 Right-click on it and choose Hyper-V Manager. 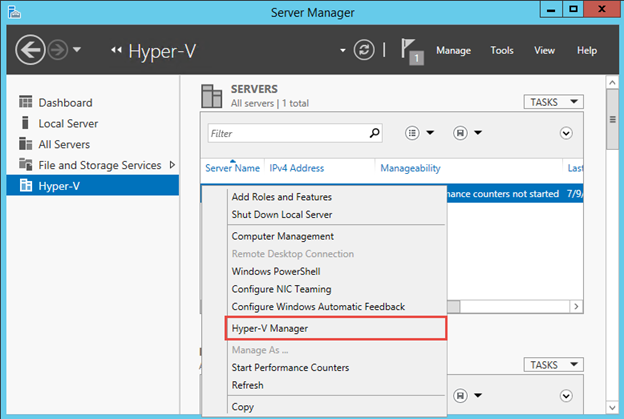 Hyper-V manager opens. 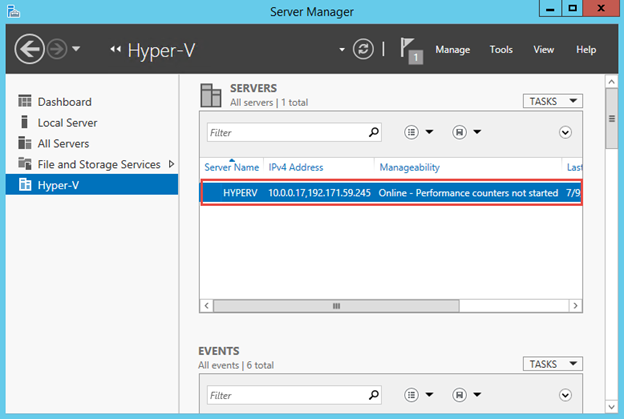 Now you have a new Hyper-V server. 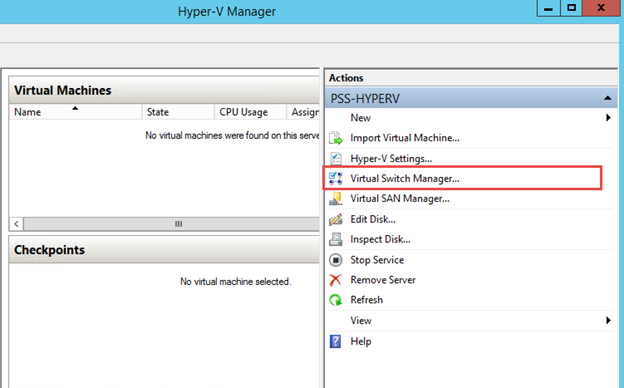 I see that Hyper-V already created two Virtual Switches for me as I mentioned. 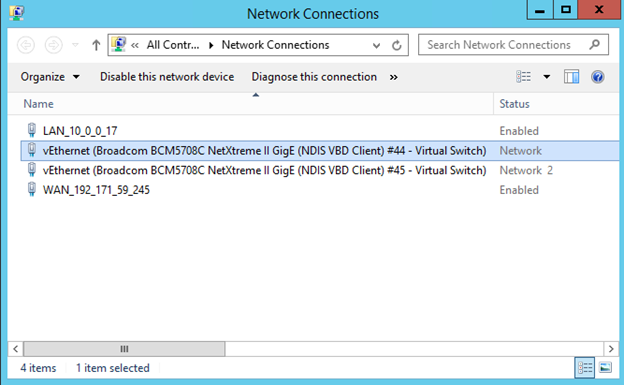 I am going to rename the Virtual Switches to some friendly names instead of the long names “Broadcom BCM5708C NetXtreme II GigE (NDIS VBD Client) #44 – Virtual Switch” and “Broadcom BCM5708C NetXtreme II GigE (NDIS VBD Client) #45 – Virtual Switch“. Base on the Network Connection information, I know that the first one is connected to my LAN and the second one connects to the external WAN. 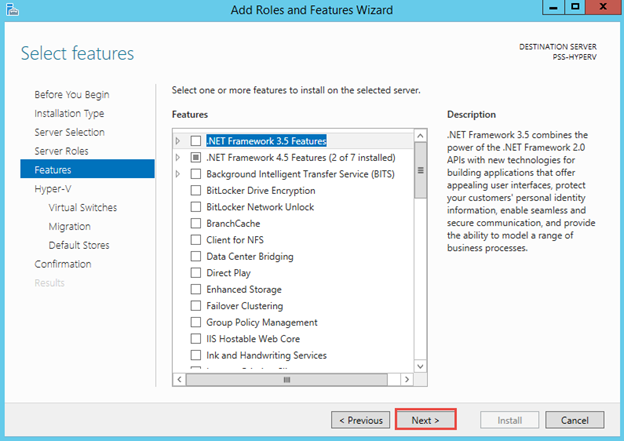 To verify that, open the Network Connections panel using the command ncpa.cpl. 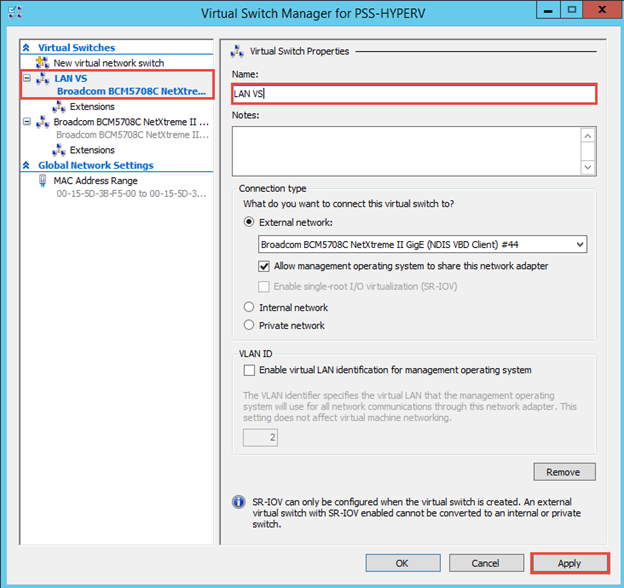 This will show the two vEthernet connections that are assigned to the Virtual Switches. Double-click on each of them and choose Details… to find out what their IP addresses are. 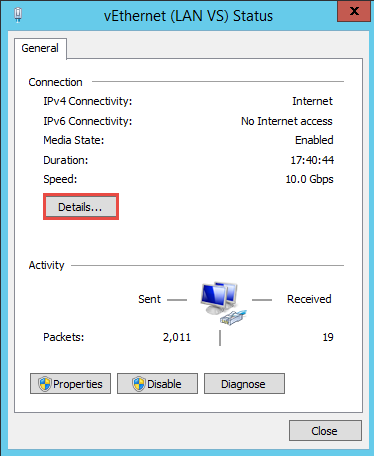 After clicking Details…, we can verify that the Ethernet Interface is assigned to the LAN or the WAN network based on their IP addresses. 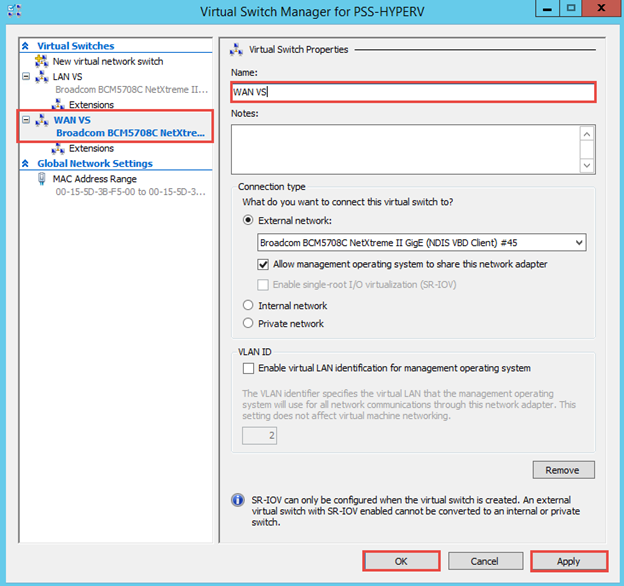 This is how you know which Virtual Switch is connected to which physical network. Based on the information found, I rename the Virtual Switches accordingly. Click Apply when done. 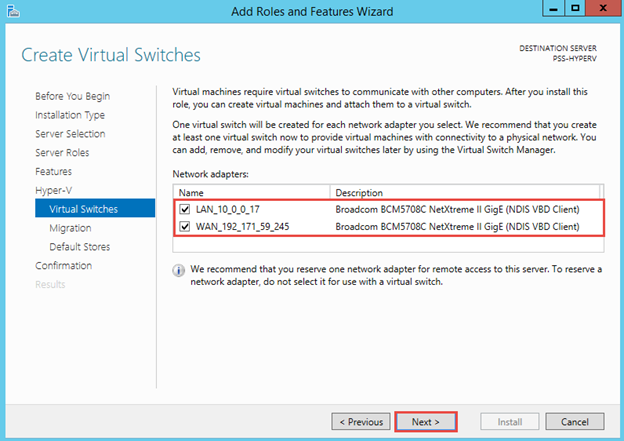 Also do the same thing to the WAN Virtual Switch. Click Apply and then click OK when done. 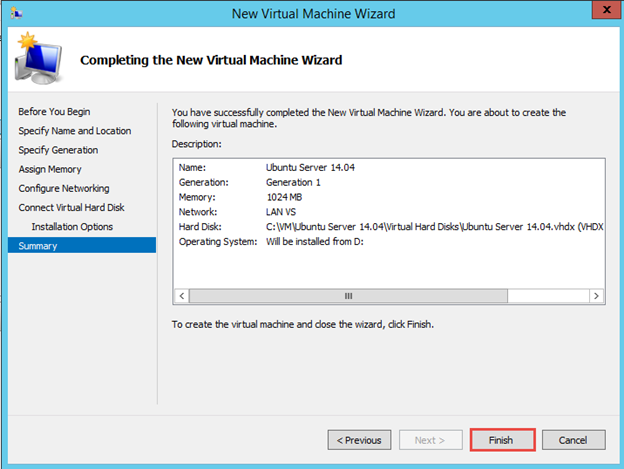 In this part, we will be creating a new Virtual Machine with Ubuntu Linux Server. We will not be going through the OS installation process here, as that process has been covered in other labs already. 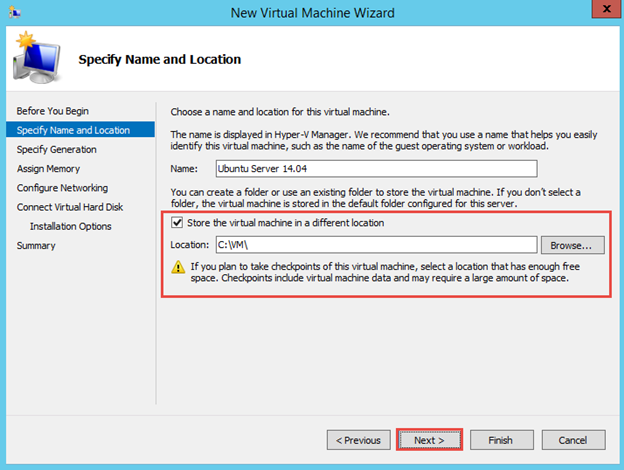 Enter the Name for the Virtual Machine, Choose the location for it and click Next. 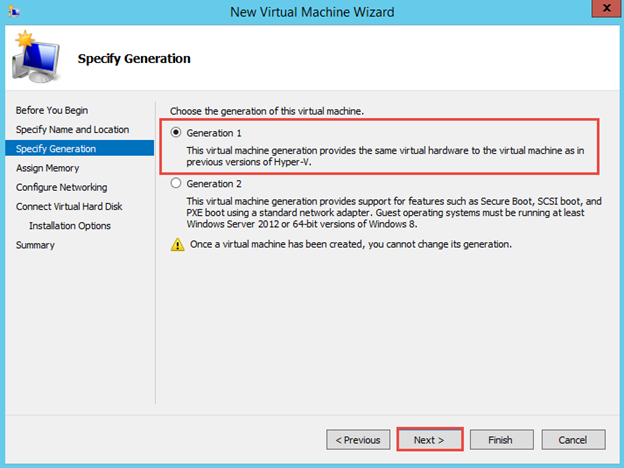 Choose Generation 1 and click Next. 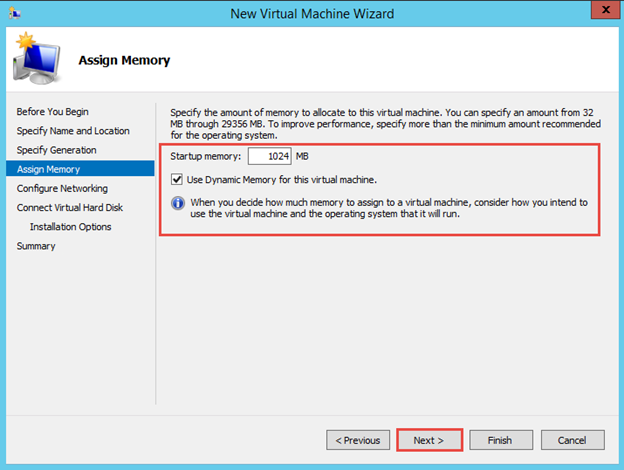 Choose memory amount and click Next. 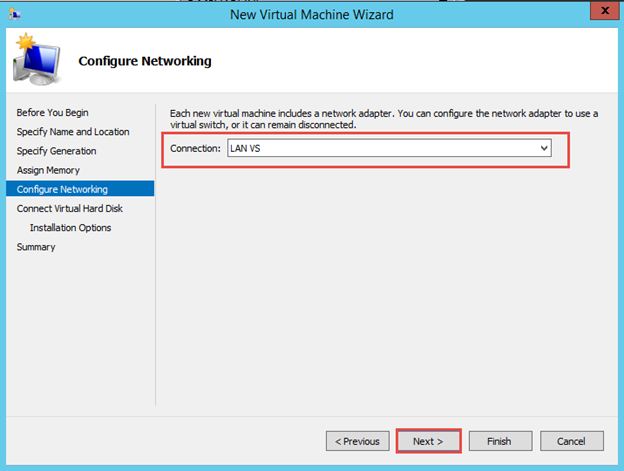 Here I choose the LAN virtual switch to connect my virtual machine to. This means my Ubuntu will communicate in the 10.0.0.0/24 network. Click Next. 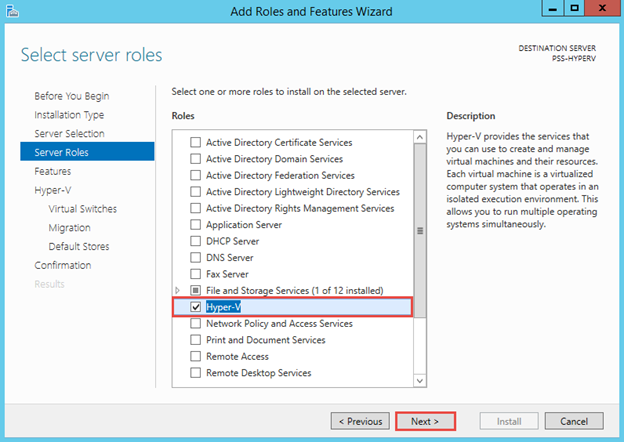 Choose a 10GB disk and click Next. 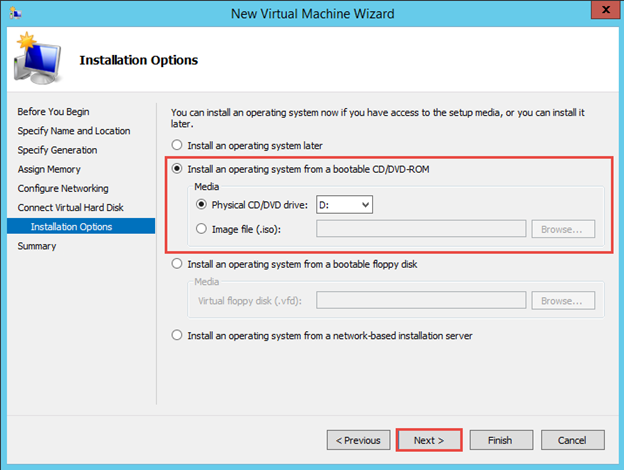 Choose the Physical DVD to boot from and click Next. 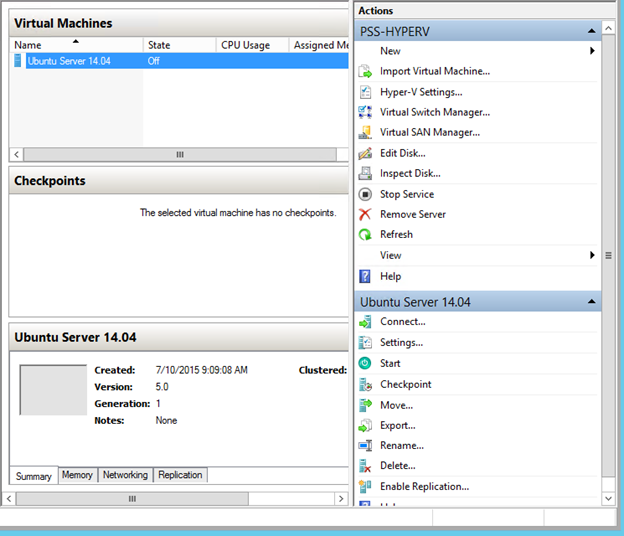 As you can see, the new Virtual Machine has been created successfully and it is in the OFF state. 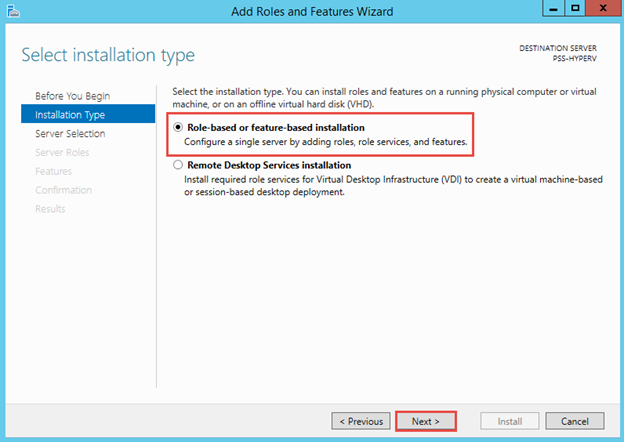 you can now turn it on the perform the OS installation.